Multiple varieties of chilies give this extreme heat barbecue sauce an excellent earthy, smoky depth most pepper-focused sauces lack. Wildcard Sauces was born out of brothers Ryan and Kyle Fraser desire to quite their corporate gigs and go all in for something they truly love—barbecue. 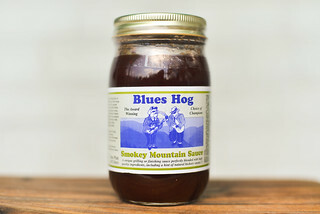 This led them on a hunt to find out exactly what makes the best barbecue, and out of that came a line of high quality sauces that range from sweet to extreme heat to please a multitude of pallets. After meeting one of the founders in person at a beer tasting event in Chapel Hill, NC, I picked up a couple of their more unique sauces to try out that included their Mexican mole-inspired Desperado and this bottle of The Spectre, whose heat comes from insanely hot ghost peppers. A plethora of chili aromas file the nose on first whiff of this sauce. There's distinct hints of smoky chipotles and earthy anchos along with other chiles that form a hint of the heat held within. The rest of the sauce is rather understated though, with a mild ketchup-y smell whose sweetness is put into check with a mellow vinegar tanginess. There some depth beyond that by way of Worcestershire, garlic, and onion. This maroon sauce is semi-transparent, which makes it easy to see the tons of spice specs throughout that come in red, black, and white. It has a glossy sheen and a smooth, medium-thin consistancy. The sauce falls quickly and in a steady stream at first off of a suspended spoon. The pour then switches over to fast drips, which start large and become smaller as less sauce is left on the spoon. In the end, only a thin layer of sauce remains coating the silverware. This sauce starts out with a pleasant sweetness that has a bright, fruity tomato ketchup flavor. Next a mild tang mixes in, along with depth and savoriness from Worcestershire and soy sauces. Then there are fleeting tastes of onion and garlic before the chiles take over. Just like in the aroma, there are many layers of pepper in the flavor. It starts out a little earthy and sweet, then becomes mildly smoky from chipotle. The heavy hitters come in next with a burn that intensifies rapidly until it overtakes all else, leaving your mouth on fire. The heat was so intense that only a small spoonful created a hiccup response in me, which only happens with the hottest of the hot sauces. The sauce coated the chicken in a thin and even layer that was pale at first, but gained heft and color with multiple brushings over indirect heat. When moved over direct heat, the sauce stayed firmly in place and picked up attractive caramelization with no burning. Like with most sauces, the sweetness amped up a bit and the heat backed down after being cooked, which left this chicken leg with a pretty amazing flavor. The fleeting sweetness, tang, and savoriness from out of the jar were more prominent now, while the immense amount of peppers ensured the sauce still delivered a great burn, just not so crazily mouth scorching as it was before being cooked. Still, after eating one chicken leg, I had a good burn going, making me think just one or two more pieces would be all I could comfortably handle. If you follow my reviews, you know I love a good hot barbecue sauce. Still, the ones I give highest marks to generally balance sweetness and heat in an equal dance and I tend ding those whose heat overtakes all else a point or two because that burn comes at the expense of delivering an ideal barbecue sauce complexity. 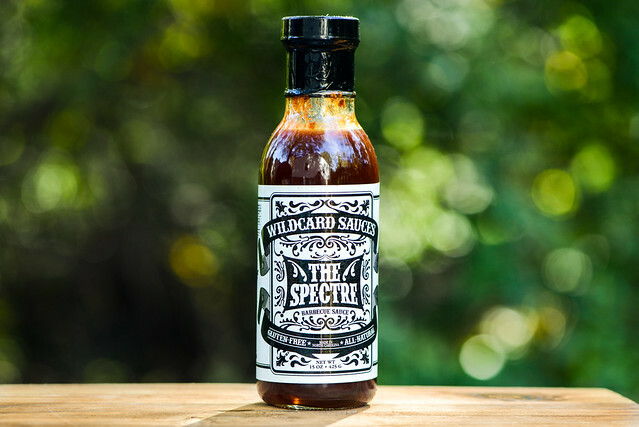 The Spectre, however, does something few other extreme heat sauces do—it uses peppers to build even more complexity rather than completely drown it out. You get the standard bearers of tomato, sugar, and vinegar upfront, but when the heat takes those over, it does so in a manner that adds even more flavors, like earthiness and smokiness. 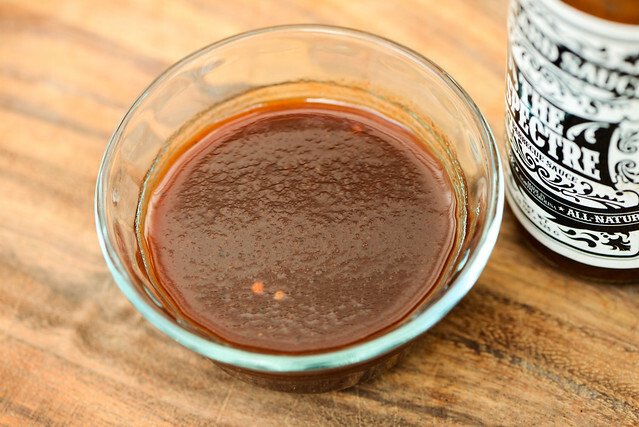 This, to me, is what a great barbecue sauce should do—continue to build upon its depth and keep upping the ante on your taste buds. 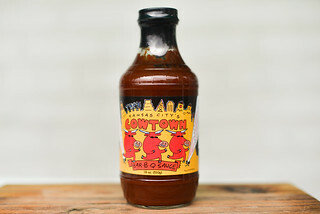 I admit that out of the jar the heat is probably a bit much for the average person, but after being cooked, this sauce really shines with its more muted savory qualities coming forward while the heat takes a small step back and the sweetness a small step forward. It made for an incredible piece of chicken, and I think it would do wonders on a rack of ribs, pork chops, and even steaks (and I'm not one to usually sauce beef). 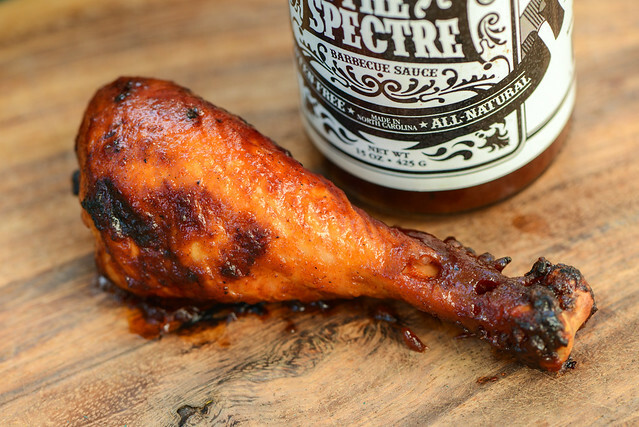 If you can take the heat, The Spectre is the hot barbecue sauce the beat. Just finished reading your list of 9's ... For guests that don't like or can't handle spicy hot food, would something like this still be safe to baste with? I'm under the impression it might be wise to marinate or prep the chicken one way, but baste with another, but I haven't yet made it over to your recipes yet. It's your description of the peppers' flavors, not heat, that got me interested. And it seems to be a common trait with "hot" BBQ sauces, in that they don't remain hot once heated on the grill. 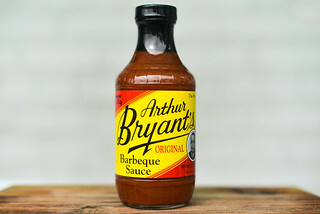 As an aside, I'm wondering if BBQ sauces that lean more heavily toward vinegar don't exacerbate a spicy, hot tendency.